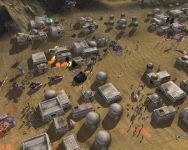 Star Wars: Imperial Winter is a free, multi-platform, real time strategy game using the open-source Spring RTS engine. 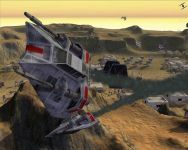 Featuring over a hundred different units for the Galactic Empire and Rebel Alliance, spanning from The Phantom Menace to Return of the Jedi, SW:IW aims to not only contain the best gameplay of any Star Wars RTS, but the most diverse cast of units, including: Stormtroopers, TIE Fighters, X-Wings, stealthy Rebel Commandos, Bothan spies, Royal Guards, Wookiees, "reactivated" Battle Droids, repulsorlift tanks, walkers, and more! 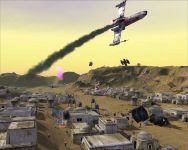 Gameplay features include asymmetrical balance, with the two factions playing very differently from each other; territory-based constant-income resource system allowing a fluid economy rather than paying upfront; realistic weapon physics, with every single projectile's path is realistically calculated, meaning your men can hide behind a hill from enemy laser fire but not from an artillery cannon, and many other features. Some units, such as Jedi/Sith and AT-AT walkers, will not be initially available because of the balance issues they bring. We must first develop the lower-level units before we can implement such strong units. If you would like to help or make suggestions, contact via our forum [Imperialwinter.com], or via email: starwarsspring [at] gmail [dot] com . I thought seeing as it's been so long since our last newspost here (part laziness, part not wanting to knock off the PCG article news), I thought I'd let everyone know how everything is going, and make sure you're all well aware that Star Wars: Imperial Winter is moving along at an excellent pace. We've entered a stage of heavy beta-testing, with around 15 regular testers running games almost nightly. Our design is certainly being put through it's paces, and there are plenty of issues both big and small that we are working our way through. On the whole, feedback is positive, and the game seems to be developing as we've foreseen (cue emperor's cackle). Imperial Winter is proving to be a well paced strategic-level game revolving around territorial control with an emphasis on troop manuevering and placement. The main body of player's armed forces is made up by infantry (being necessary to capture territory), who are then supported by vehicles and air. Currently, the beta players are playing with a limited unit set, restricted from what we have planned for the final public release so that we could ensure a tight balance for the early tiers. We are working hard on finishing up the final heavy units for the public release, so that we can introduce it to the testing pool, fine tune, and then release to you! We'll be showing off some of our completed units in the coming weeks, so keep checking our moddb page. To get things off the bat, here are some images showing off our new Tatooine mapset, with features by Gnomre and myself, and the gorgeous map produced by a new team member, Beherith. Amidst the action you might be able to spot a few of the previously unseen Imperial Walkers that our talented skinner Lynx has finished in the last few weeks. Star Wars Spring is featured in the February issue of PC Gamer UK! New media and a new means for anyone to get involved in SWS - even those without modding abilities! OH BOY this looks orgasmic! May sound dumb but are you planning a mac release ? It looked good, but why does it have to be dead? has this come to a stop? If you look at their forums it says that it was placed in statis because of some of the key contributors having moved on.